Young Living membership brings along numerous benefits. Commissions, reward points, silver six program, diamond program – all these are rewards of being a Young Living member. However, these rewards can only be obtained when you sign up as a member, attract more people and sponsor their sign ups. And this can only be done when you share your essential oil story. My Oil Site offers easy customization for all Young Living members. Our step by step guide walks you through the process and helps you select the web layout and color schemes according to your choice. Before working on your website, you can view a ‘demo website’ to get an idea of what’s in store and what options you have to choose from. My Oil Site offers quick, hassle-free social media sharing. We are aware of the fact that you might have been sharing your essential oil story through a blog or a social media account. Thus, moving to a new platform could cost you repeat customers and sign-ups. As a solution to this problem, we offer quick social media integration and sharing. When you’re setting up your website, we make sure that all your social media accounts are linked. This way, you do not lose your customers and sign-ups. Instead, your customers will be amazed to see your new website! This is one of the most essential aspects of building a website My Oil Site. 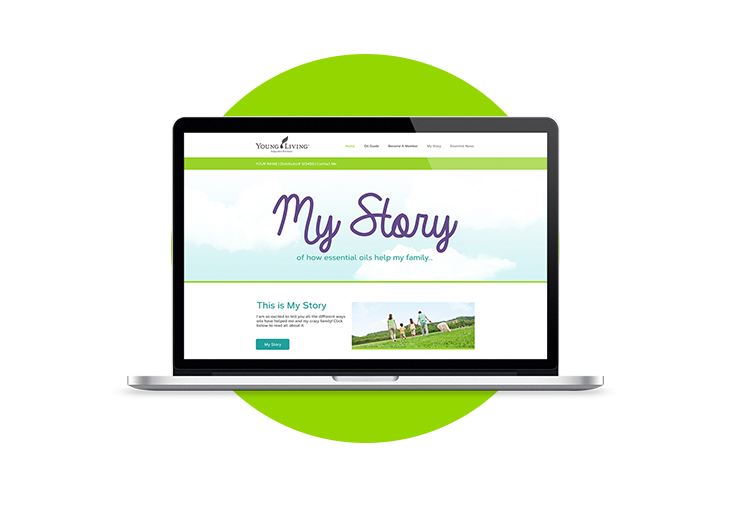 Our website features a share your story page, through which you can share your own essential oil experiences, in order to attract more customers. We realize the importance of this page which is why this page is setup carefully. For you to make money, your story should be inspirational enough to compel people to sign-up as a member. Customers decide to sign up after reading your story. What do they have to do? Instead of leaving people wondering, there’s a sign up link that makes things easier for them. This page will directly lead them to Young Living membership sign up form and your sponsor ID will appear automatically. Congratulations – you’re now entitled to a number of commissions, reward points and other programs! So, what are you waiting for? Get in touch with us and build your website in no time. In addition to this, you can receive creatively designed business cards from us for your essential oil business.